Remember last week when I said that you couldn’t go to Hawaii and not have a Mai Tai (or Man Tai, if you’re autocorrect!)? Well, I’d also like to say that you cannot–under ANY circumstances–go to Hawaii and not have pineapple. Even if you think you hate pineapple, eating them in Hawaii just might change your mind…or your life. Pineapple in Hawaii is like nothing you’ve ever tasted before. Even the sweetest, best tasting pineapple you’ve ever had stateside pales in comparison. In fact, if pineapple is your favorite fruit, you definitely want to make a trip (or yearly trip) to Hawaii. 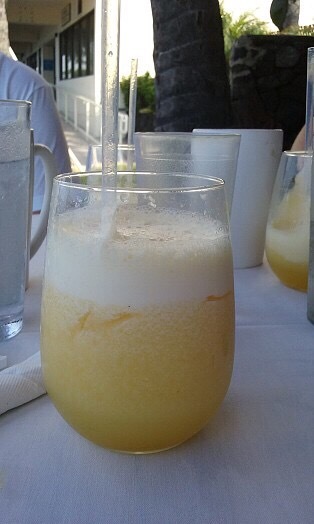 I’m pretty sure we had fresh pineapple juice nearly every morning we ate out for breakfast. I’m not sure you “squeeze” a pineapple, but whatever they did, it was pretty damn delicious! As previously mentioned, our stay on the Big Island was split by spending a couple of nights in Kona and then packing up to head to the eastern side of the island to Hilo. Actually we didn’t quite make it to Hilo, as we opted to spend the night closer to the volcano and stayed at the Volcano Inn, which is on Kilauea. If you are expecting to see lava fields when staying at the Volcano Inn, then you’re going to be disappointed because it sits smack dab in the middle of a lush rainforest. But we knew that going in and were excited by the completely dramatic shift from our Kona views. All the colors were so vibrant–especially these red flowered plants–that they almost looked fake. I totally kept touching them to make sure they were real! Even more foreign was waking to the sounds of the rainforest. We wandered down to breakfast, which included fresh banana bread and baked papaya with yogurt, bananas, and pineapple. Since we were flying out to Kauai later that afternoon, we thought it was the perfect time to sample our fruit we purchased the day before from the South Kona Fruit Stand–and we didn’t want any of it confiscated at the airport! After breakfast we went for a small hike into the rainforest, but were warned to stay on the path–which we did. No one wanted to get lost because ain’t nobody got time for that: we had a helicopter tour and to find the Tsunami Clock of Doom before our flight to Kauai later that afternoon! Soon it was time to pack up and depart from this perfect little hide-away spot, but adventure was calling! PS–I would like to take this time to clarify a certain picture (above) floating around Facebook that was taken at the Volcano Inn. Despite what the picture shows–we did NOT make April ride in the trunk of the car! I assure you she made it safely back to Minnesota! The picturesque town of Hilo has been hit by three major tsunamis in the last century. With no warning system and the largest wave, the first tsunami hit in 1946 and was the most deadly. The second hit in 1960 with a 35 foot wave, stopping the town clock at the time it was hit (1:04am). The third was in 1975 and with the smallest wave of the three, caused the least amount of damage. Of course when I heard there was a such a thing called the “Tsunami Clock of Doom,” I felt compelled to see it (and may have been a tad bit insistent about it). It sits along the Mamalahoa Highway in Hilo and I have to confess that we drove right past it several times before realizing it stands along the highway by the golf course, right before you cross the Waiākea Pond. To read the full article, click here. And if you wanted to read more about the clock, go to Roadside America’s website. 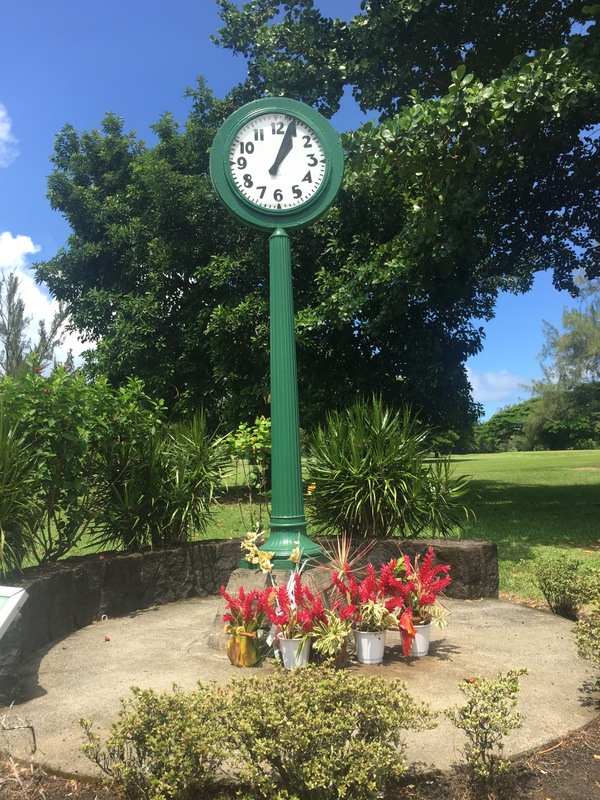 Instead of being restored, the clock was left with its hands frozen at 1:04 and now stands as a memorial for those who perished in the tsunamis.